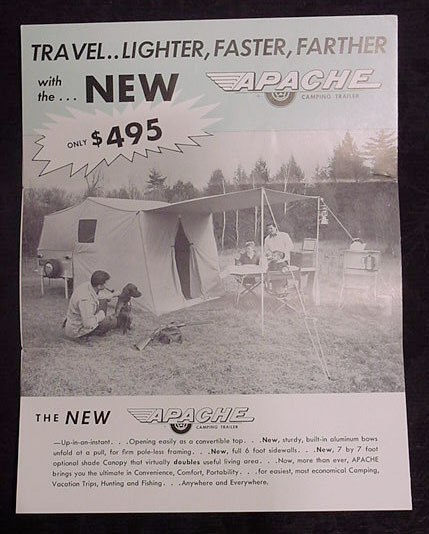 This page is dedicated to the history of the Apache. It's amazing to see the design changes that were incorporated throughout the years. 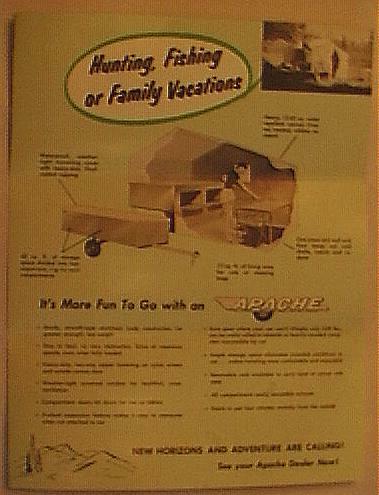 It's also fun to look at these old Apache items. 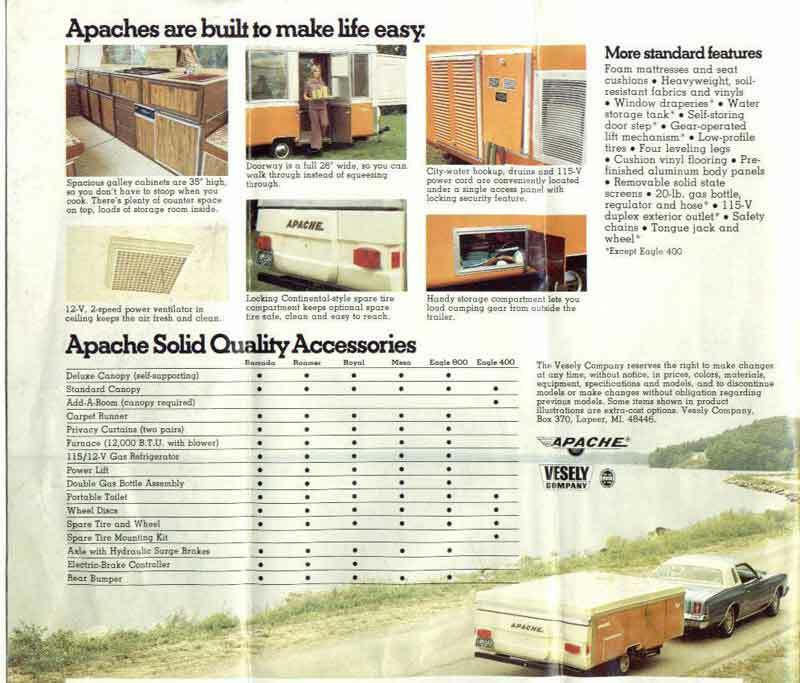 Feel free to send in your own Apache memorabilia! 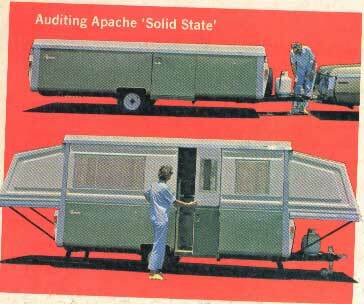 My name is Patrick Bergin and I am one of the first two people to ever sleep in an Apache camp trailer. I lived across the street from Gene Vesely who founded the company. At the time Gene as a local building contractor in Lapeer, Mich. 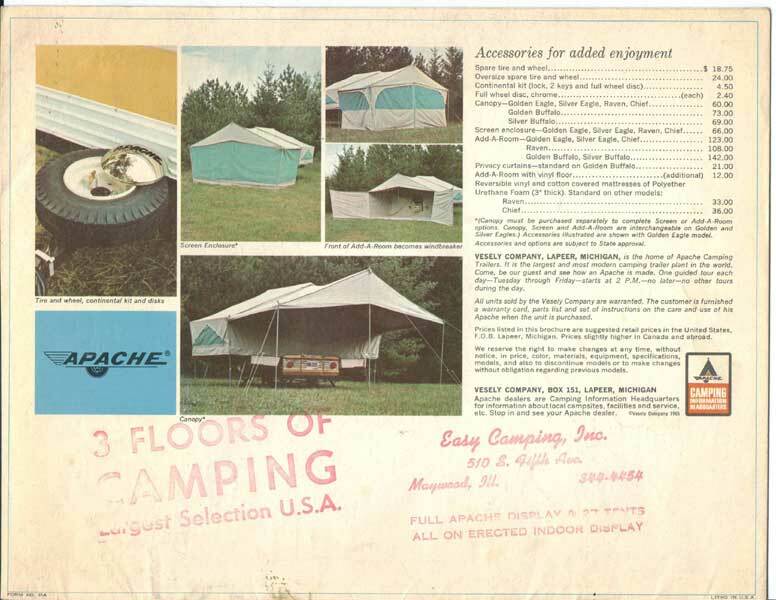 He wanted to take his family on a camping trip, but the only trailer available at the time was the Hi-Lite which only had one wheel. 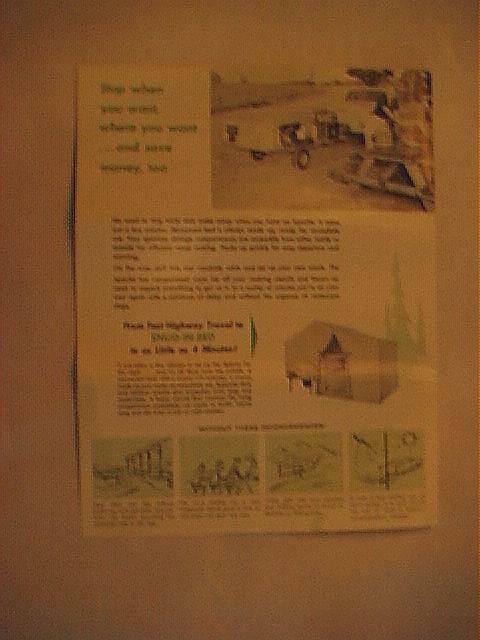 Gene decided to build a plywood trailer with a standard, two wheel axle which he could tow behind his 55 Chevy wagon. He had a local canvas maker sew up a tent for it and brought it back to his house. 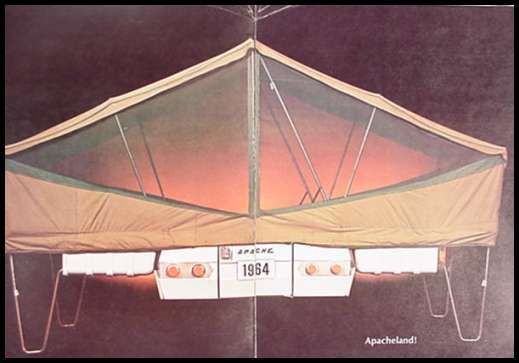 As a joke one of his friends (Bill Phifer I believe) tacked an old license for his dog "Apache" to the back of the trailer, hence the name. 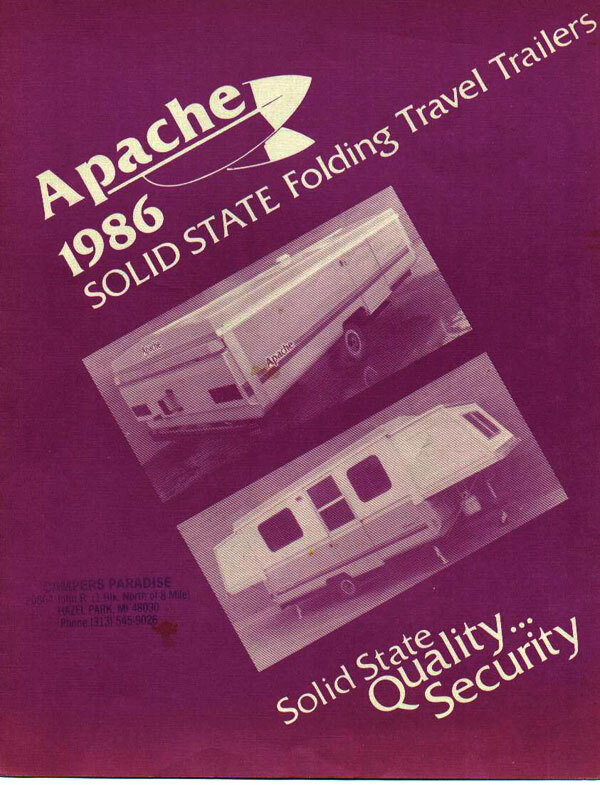 We begin our journey with the cover of the earliest Apache brochure we've ever seen. 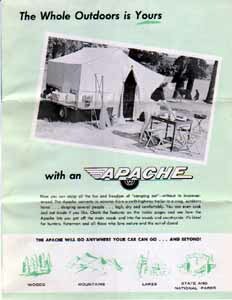 We believe this is the very first Apache ever marketed. Our best guess is 1956. The company name; Vesely. 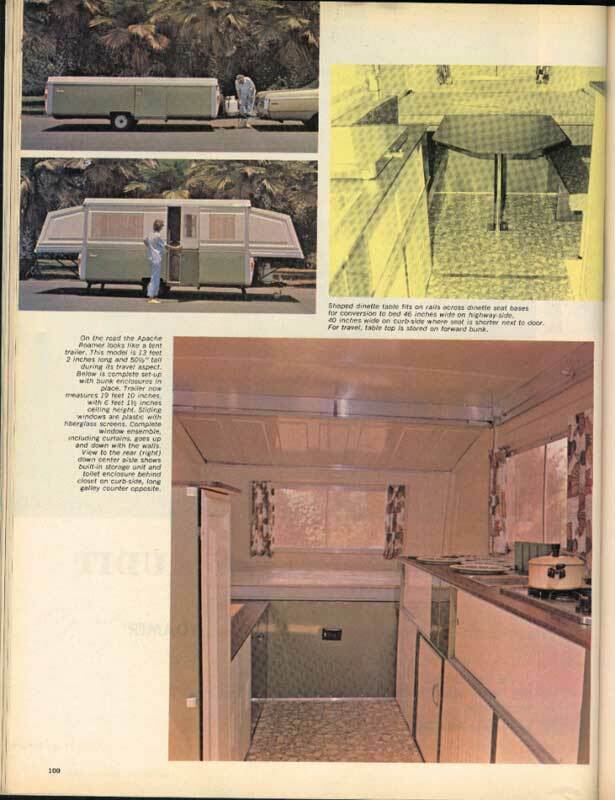 This is a really neat camper, and an entirely new concept in the world! 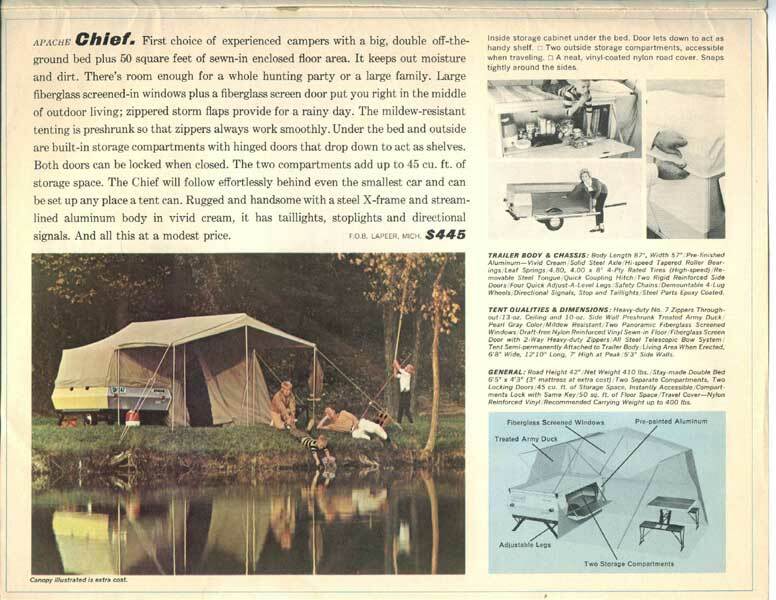 A tent on wheels!! You may click on any thumbnail photo to view the pages close up. Special thanks to Don for sending these images. 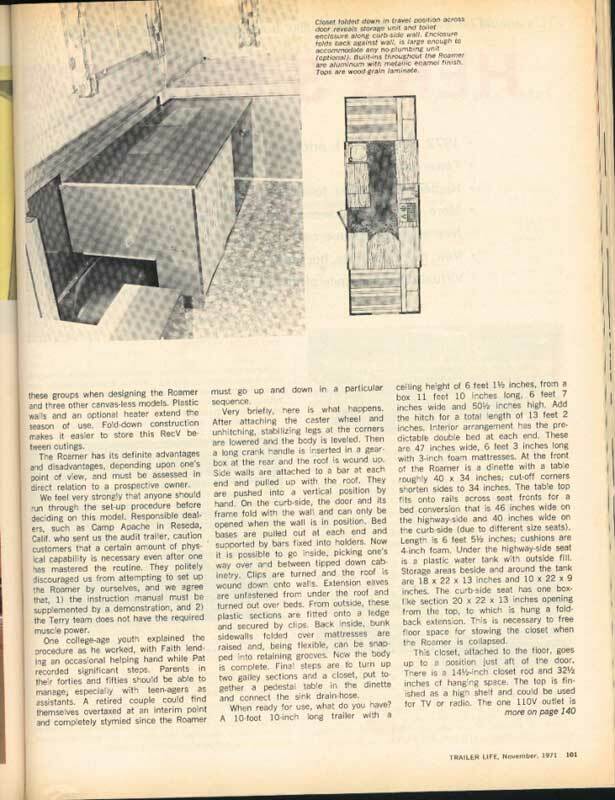 Hopefully these pages will be re-scanned soon so everyone can read the great copy. 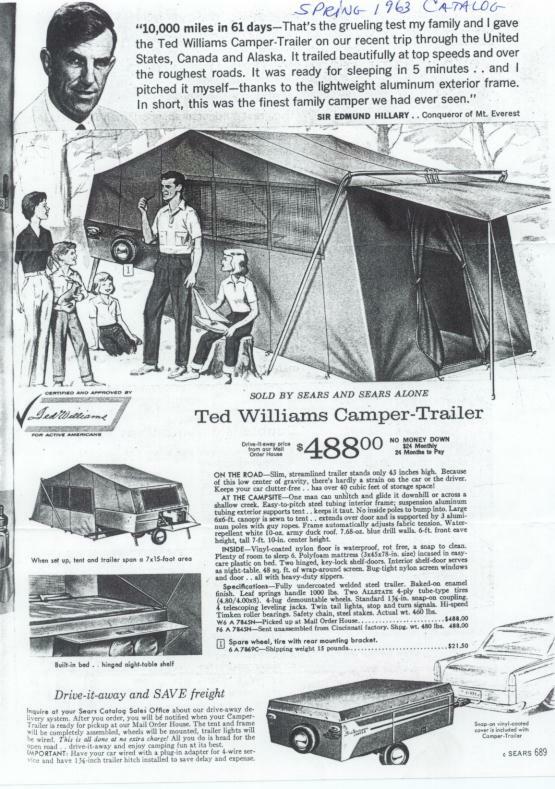 Around the same time, Vesely secured a deal to make campers for Sears & Roebuck under the Ted Williams name/series. 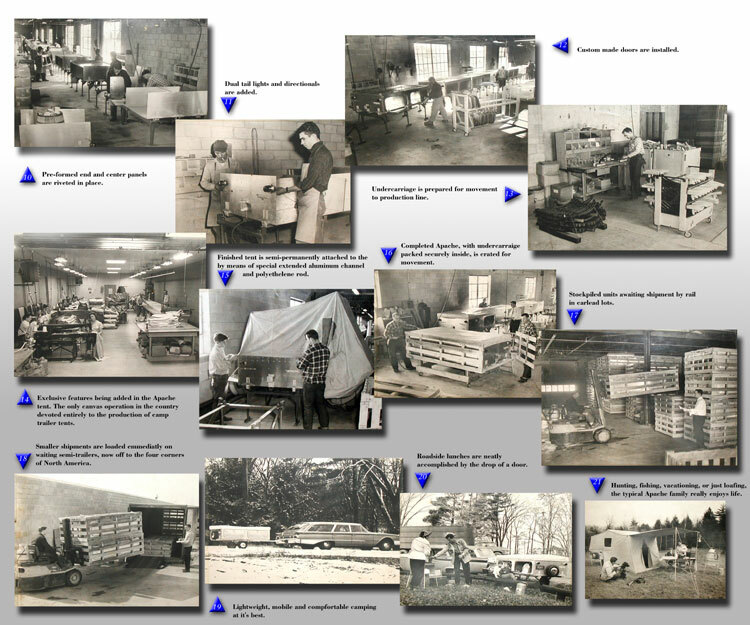 These shots were sent in by Ted Williams owner Samuel Carbaugh. The Ted Williams series is also mentioned on the Ole' Elmer page. 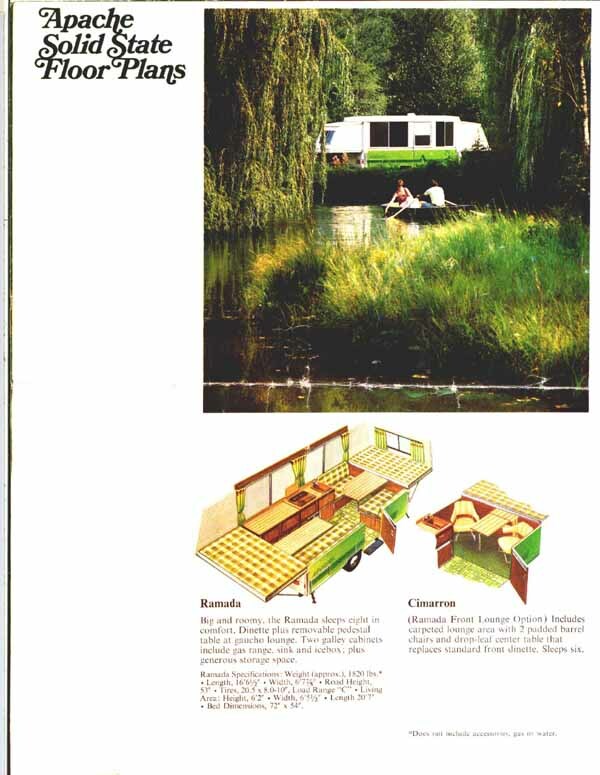 By 1959, Vesely was manufacturing and "co-branding" different model campers for Sears. 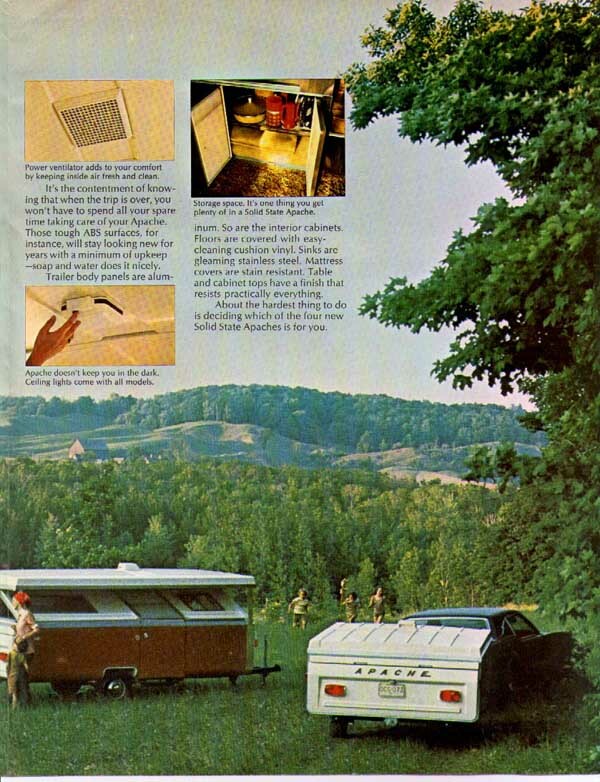 These shots are from a Simpsons-Sears catalog and the camper is called a J.C. Higgins. 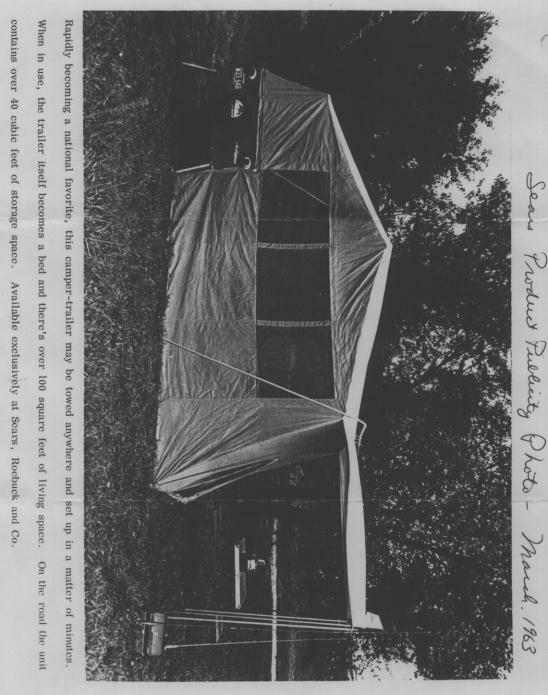 "...this tent trailer was made by the Vesley company for Simpsons-Sears. 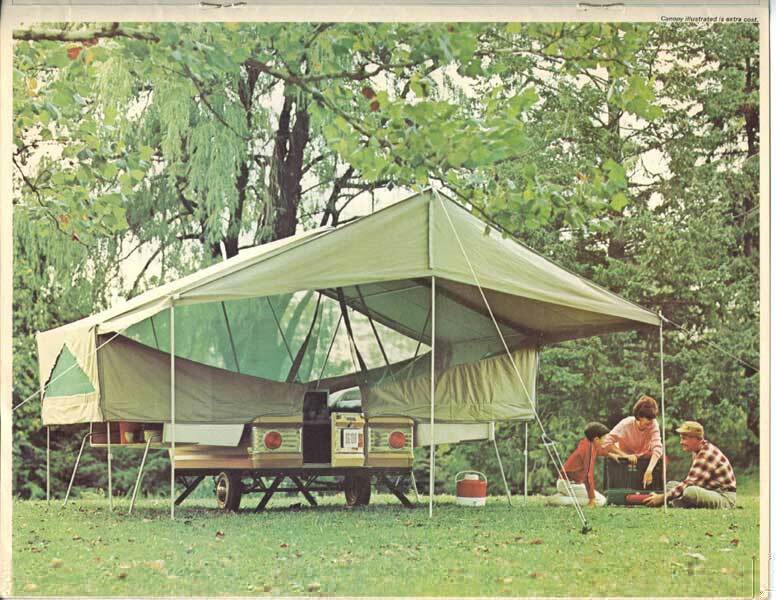 The campers were actually produced by a man named Forest Dowling who worked for Vesely in Lapeer, Michigan. He worked for Vesley until 1981, when he left to work on his farm and carry mail for the local postal service. His business was called Dowling Enterprises. 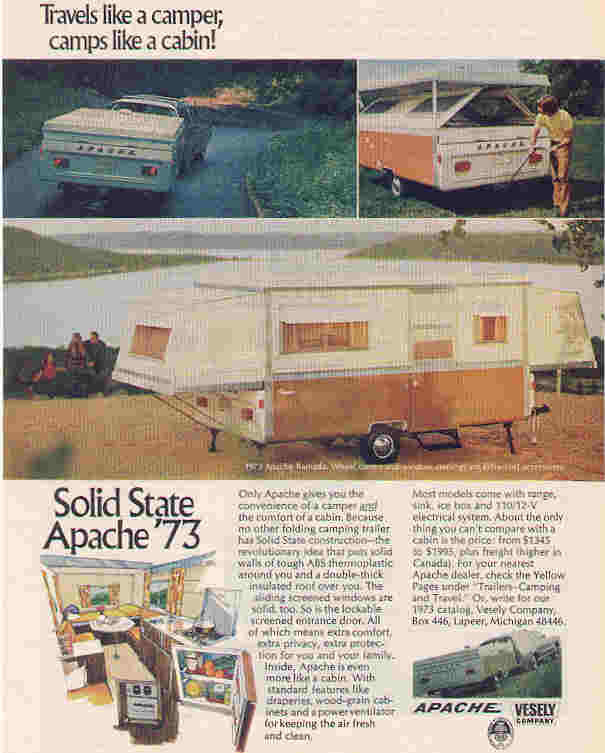 He had all kinds of Apache popup campers and some other brands on his farm. 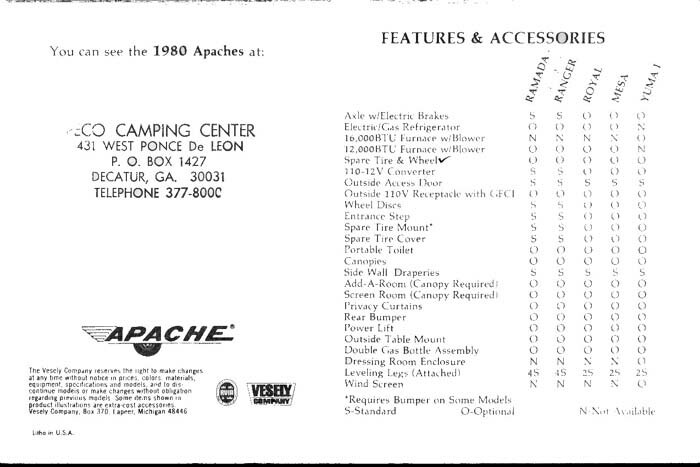 He knew everything there was to know about Apache campers. I used to take my Apache Falcon up there to get it fixed. 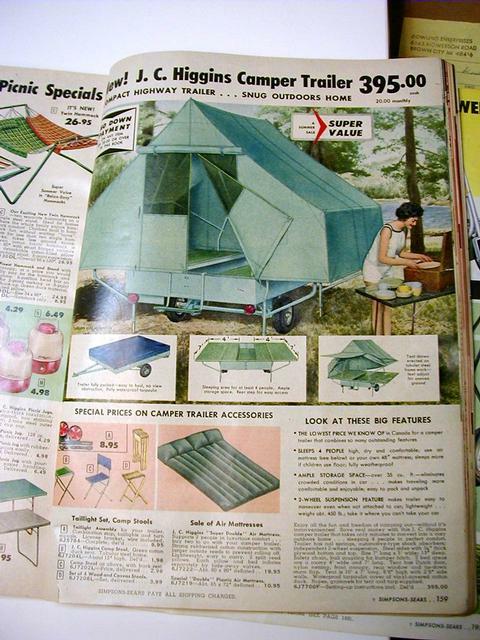 I showed him the catalog and he said yes, that camper was made by a young man working for the Vesley company - him! He passed away in 1996..." Luke Thank you for sharing your story and these pictures Luke! Thanks to you, the legend lives on!!!! 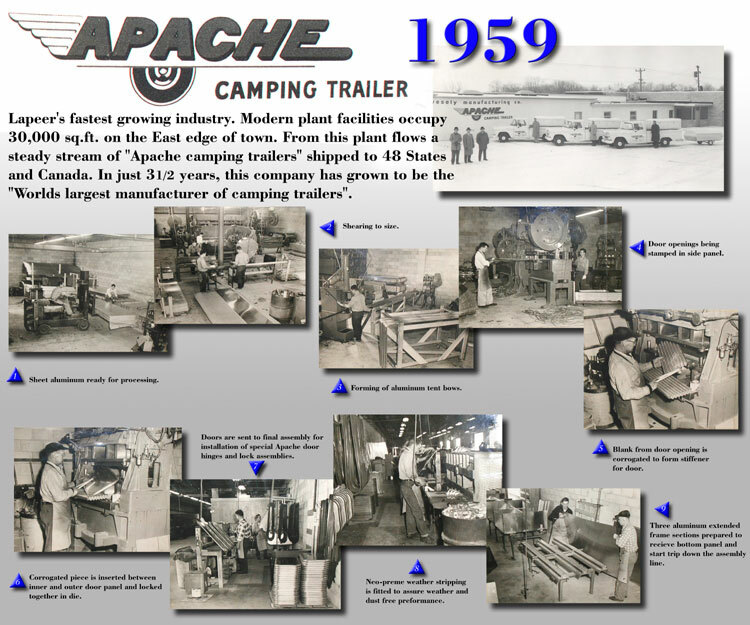 This 1959 series shows the Apache plant production line. Very cool series! Thanks for sharing this Tim!! 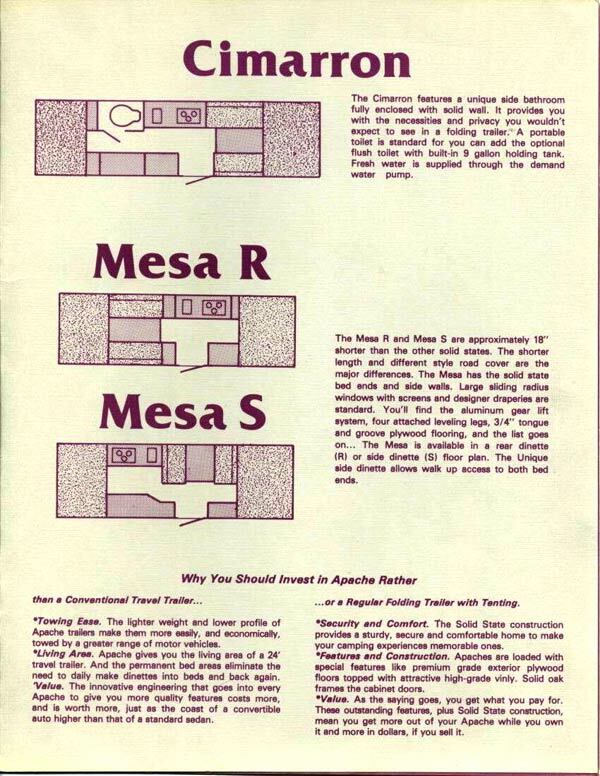 Here are a few shots of a 1960 brochure. "Forget it when you drive, it's there when you arrive". Only $495! 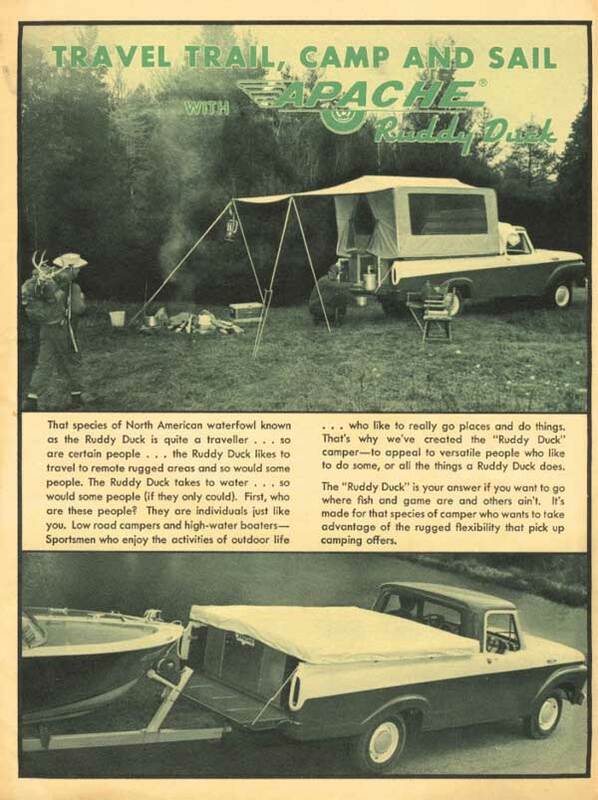 A popup camper is an entirely new phenomenon for the majority of the American public, and these early '60's ad campaigns reflect this. 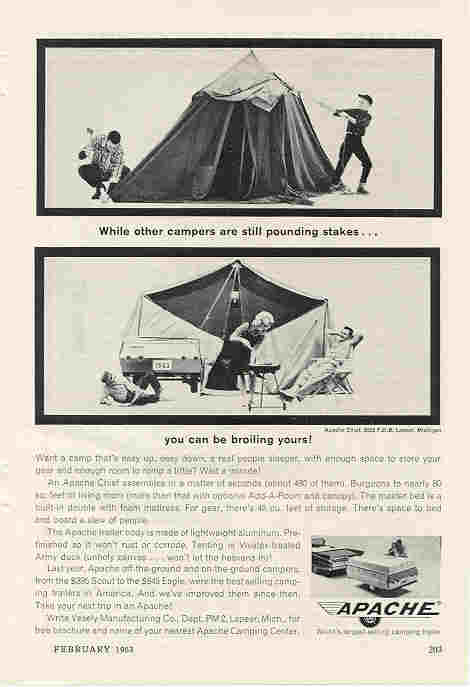 Above is a magazine ad for the 1963 Apache popup. Next stop, 1964. 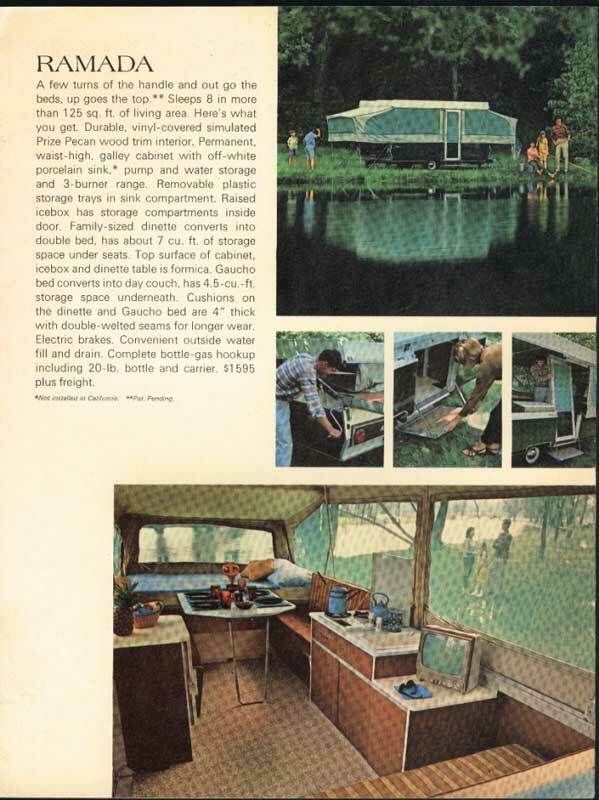 Here's the beginning of a brochure sent in by River Rat Harry. Full color! What a beauty! 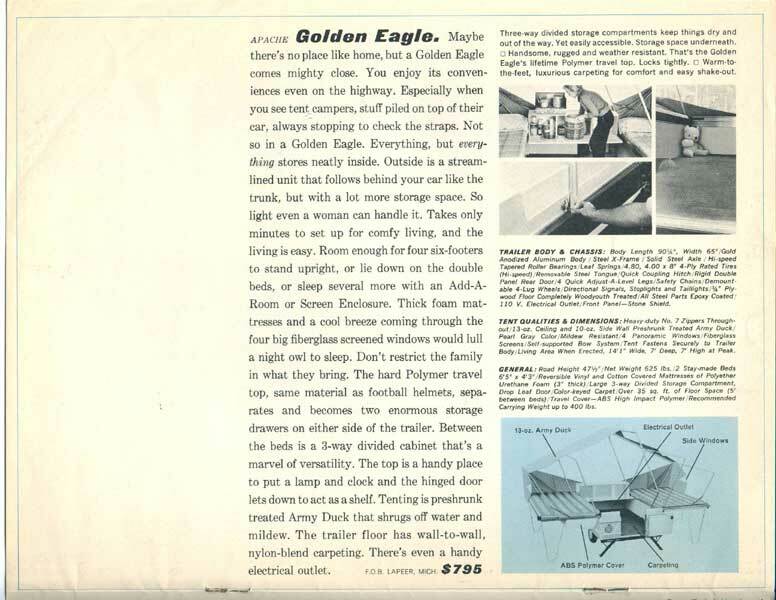 This 1965 brochure is an invaluable resource for the 60's era Apache owner/enthusiast. This shows all the 6 different models available, and even includes dimensions, specs, and original prices! Check out the options list too! 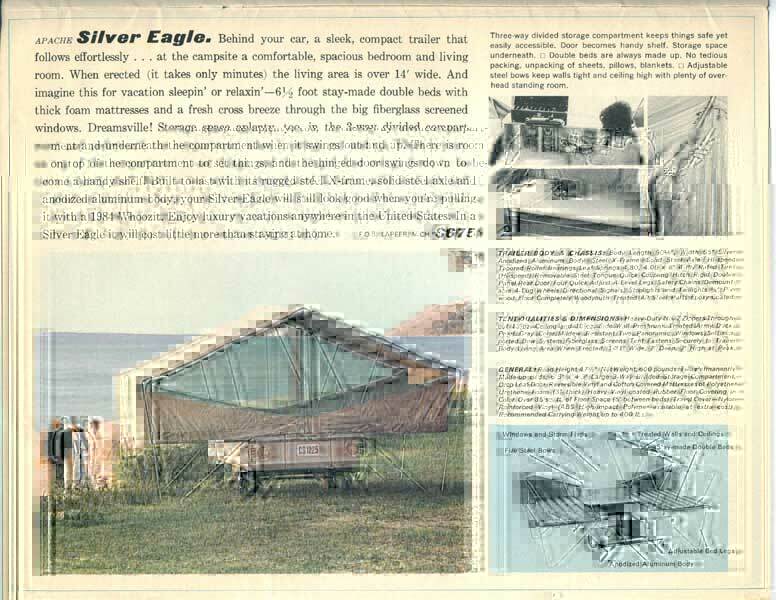 This is the earliest complete full-color brochure in the collection, and what a great one it is - thank you so much for sharing this Jim!!! 1968. 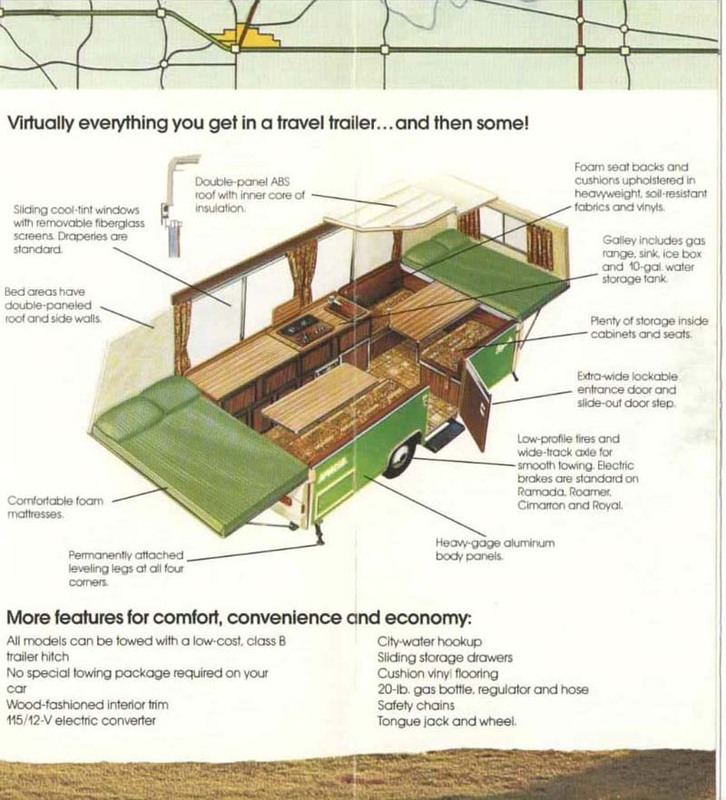 Vesely targets on the "economical way to travel" marketing message. It certainly makes sense! From the picture on this first ad, it looks like the Norman Rockwell influence is here still, mirrored from the '63 ad. Thank you Ed!!! 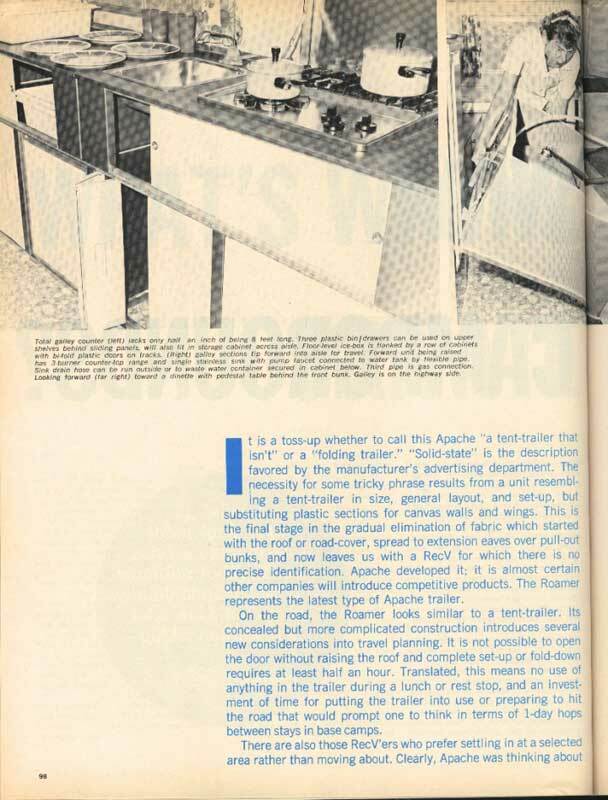 Now take a look at the 1968 Apache brochure! Again, we see 6 different models being offered. Thanks again Ed! 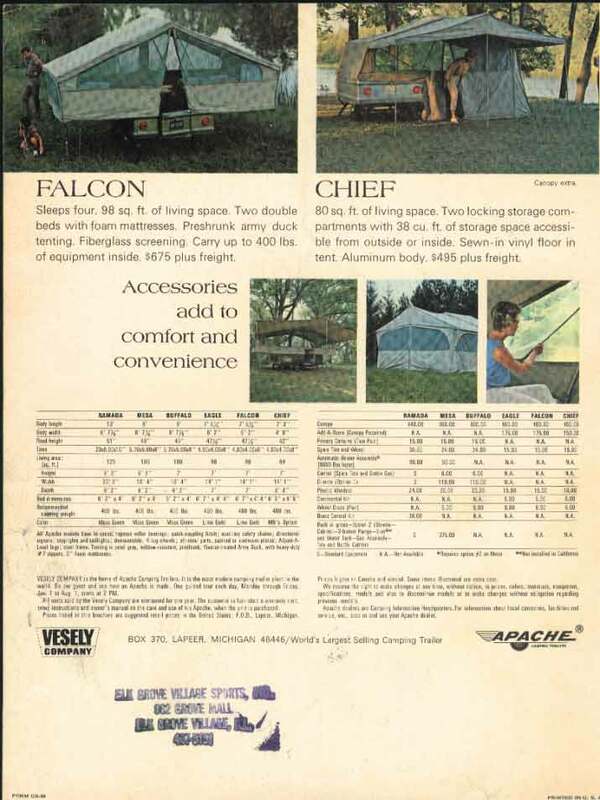 Throughout the 60's, Vesely continued to make high quality canvas-sided popup campers in various models, including Eagles, Ravens, Mesas, and Chiefs. 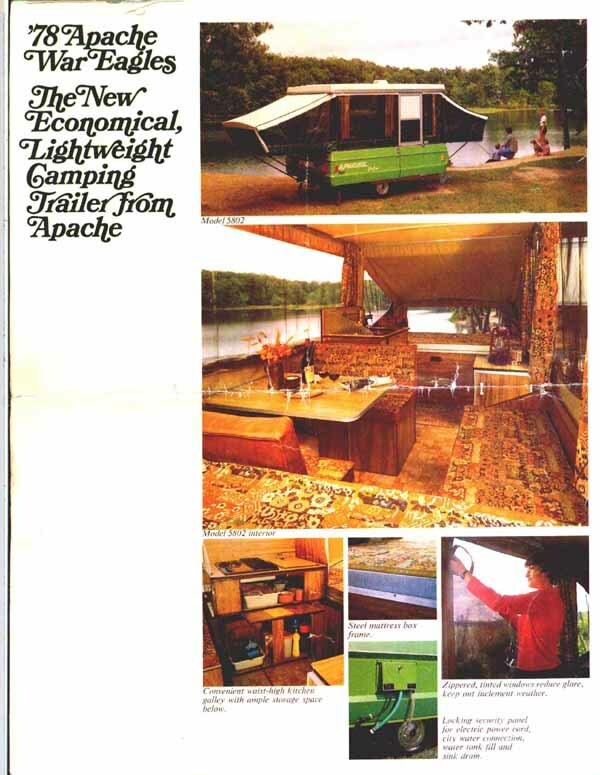 1970 marked a new decade and a new concept for popup campers. 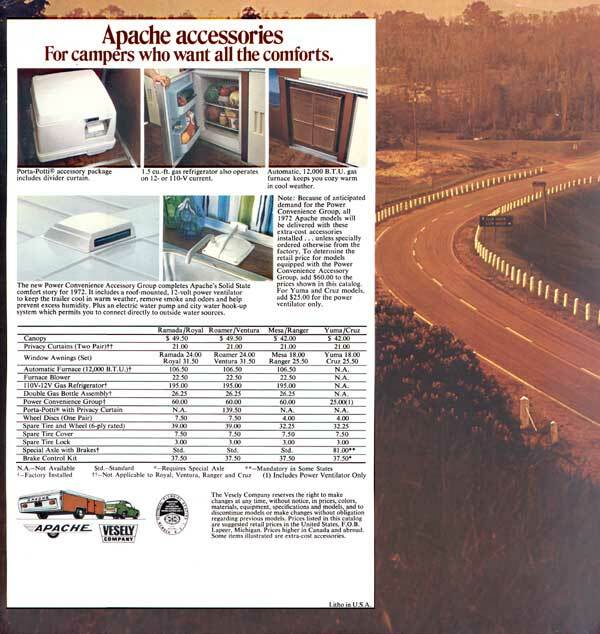 Apache introduced a new Mesa III. 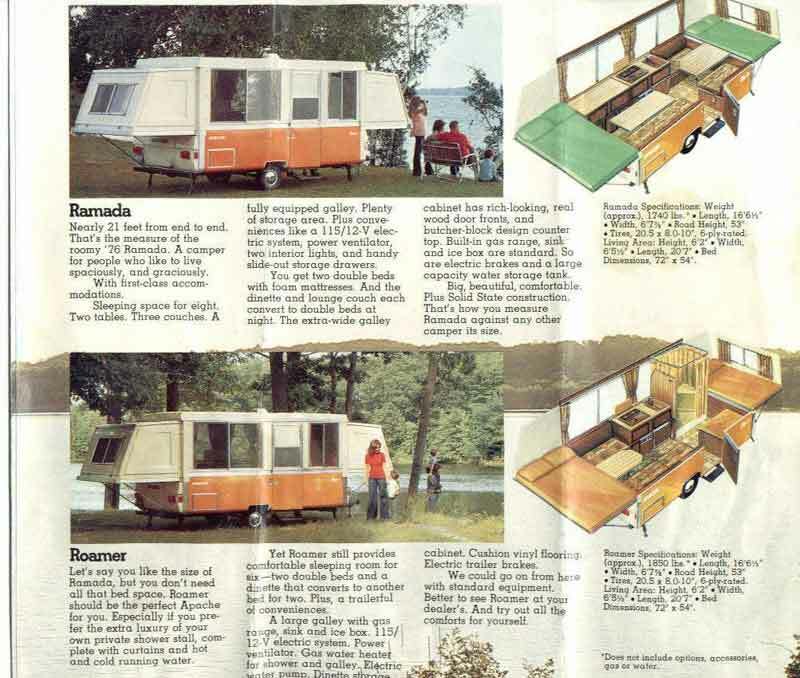 It had hard sides and hard bed end tops, but canvas-sided bed end sides. This was the precursor for the Solid State model, which arrived the following year. 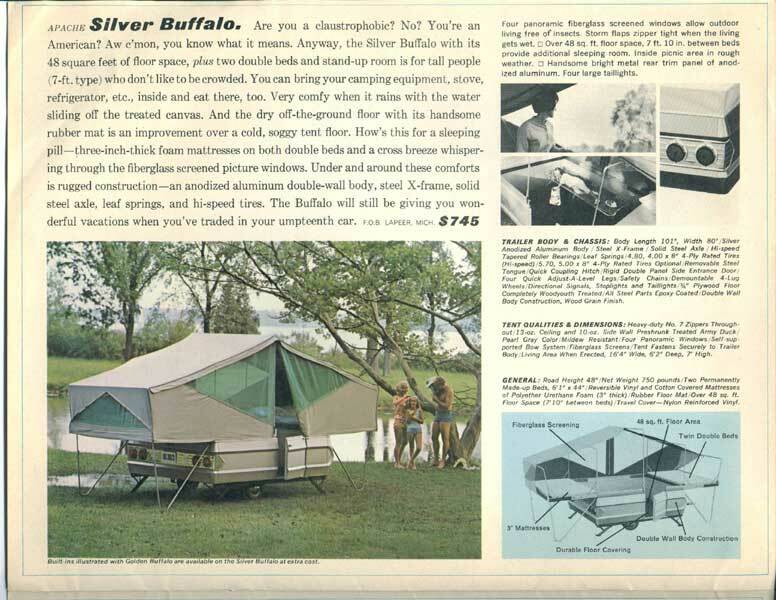 Introducing, the first ever commercially produced Solid State popup camper! NO CANVAS!!! 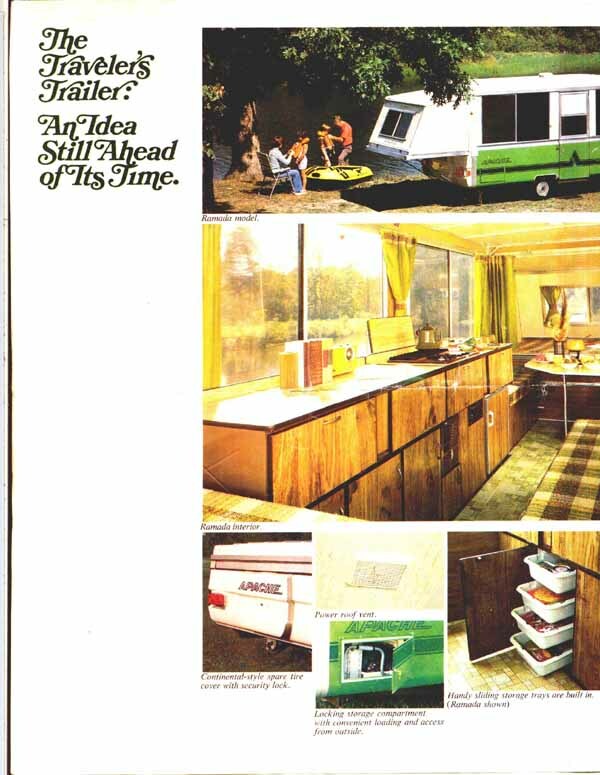 Check out this great article from a 1971 Trailer Life magazine. (Thank you Cindy & Ed!) 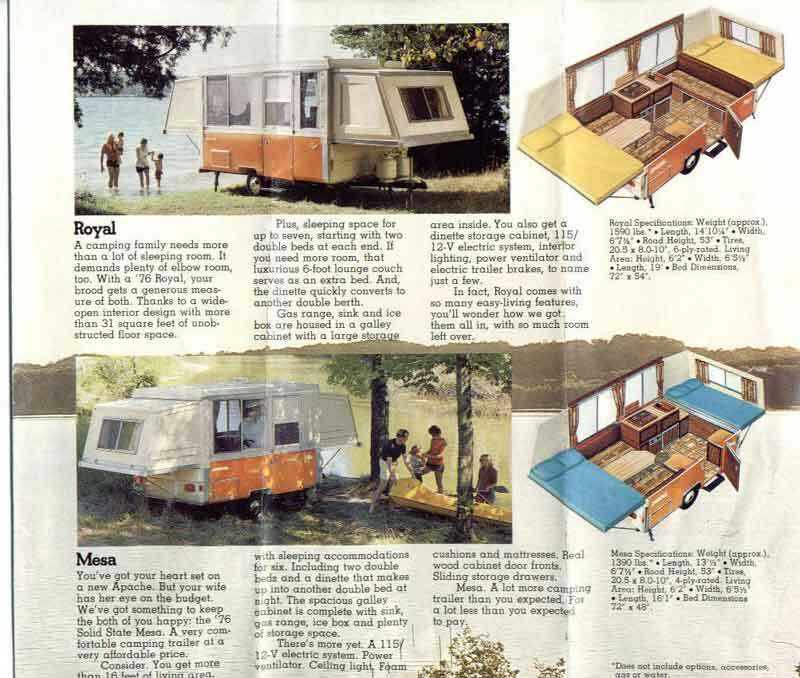 This article contains a very detailed description of a '71 Roamer - very nice! 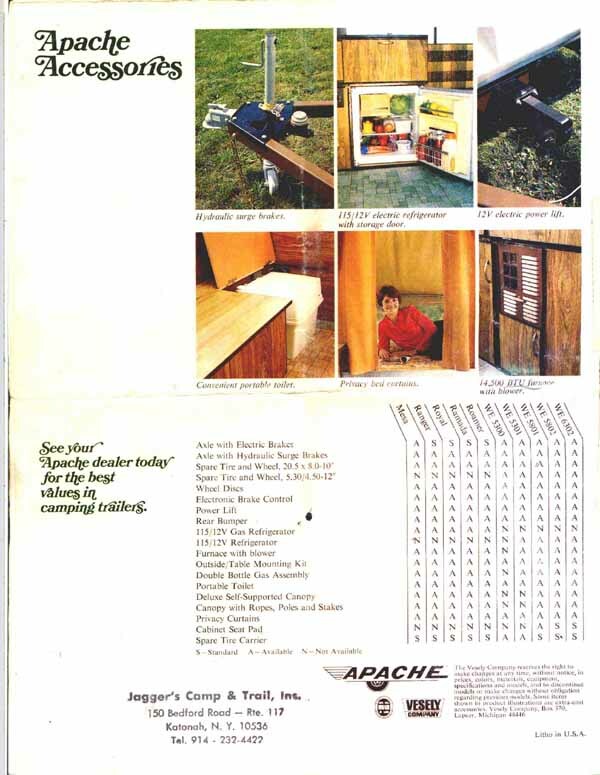 This 1971 Apache ad is unfortunately unreadable except for the heading. 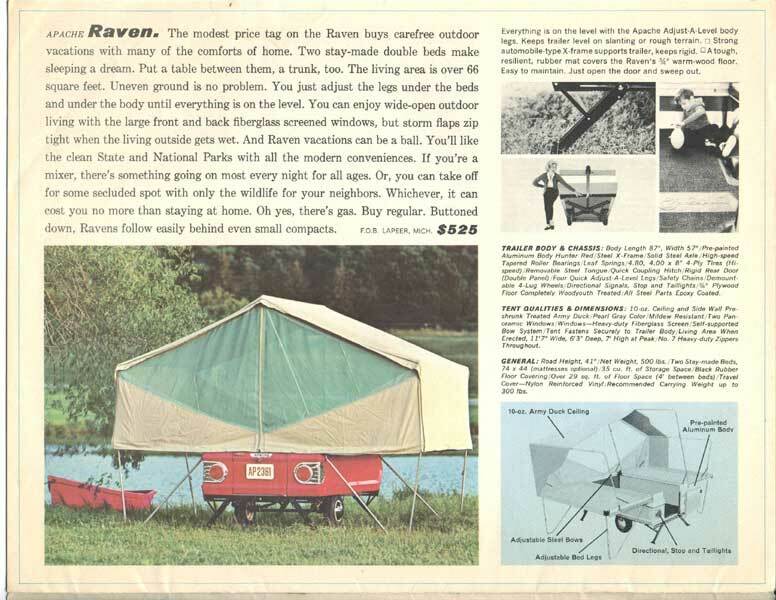 This was the world's first introduction to a solid state popup camper. 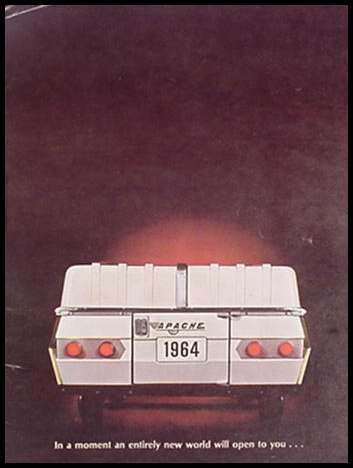 Throughout the '70's, the engineers at Vesely were getting very ingenious with their products. 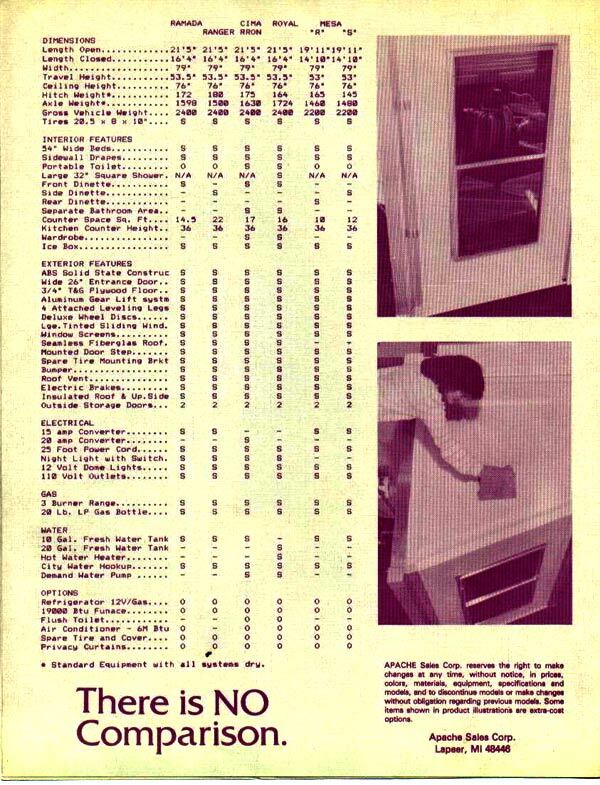 Each year witnessed new improvements to the previous model, which can be seen in the following ads and brochures. They manufactured nearly all their own parts too! 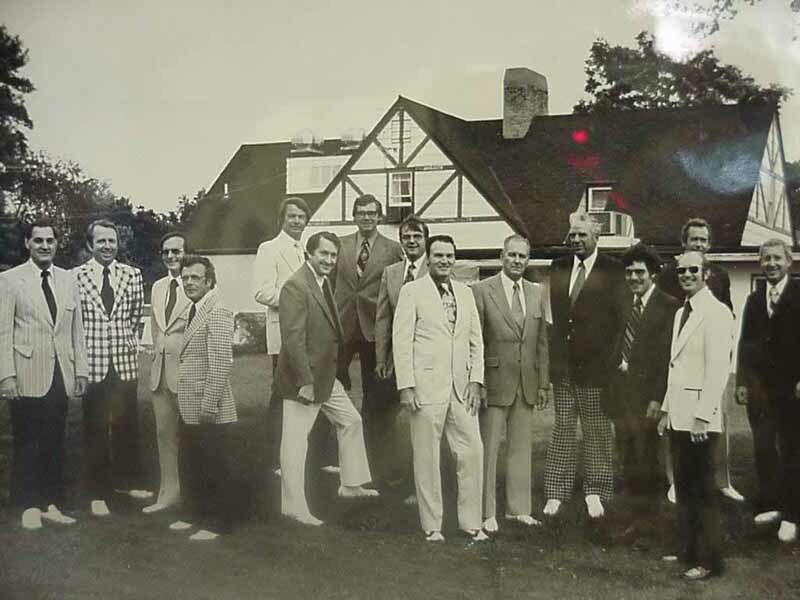 It must have been quite an environment at Vesely in the 1970's! 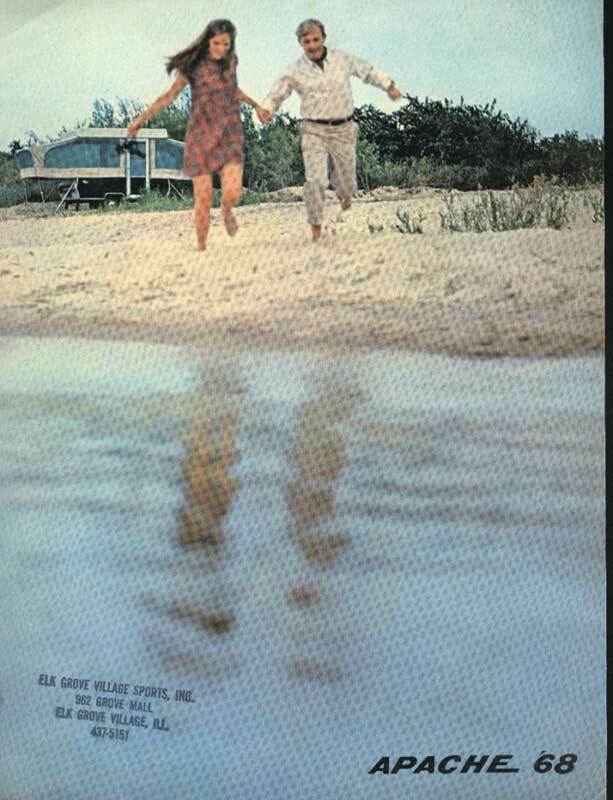 Here's a fabulous brochure from 1972 (thanks Tim & Tif!!). Notice the 4 additional models available without bed ends! I have yet to see one of these in person - they are very rare. The Ventura? The Cruz?! Welcome to 1973! 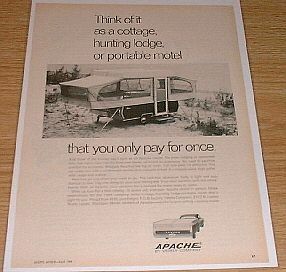 Here's a nifty ad for the fantastic Apache cabin . . . er . 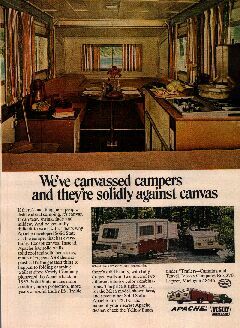 . . camper. This one's a poor scan too, but if you click on the thumbnail, you'll get a little better view of this .jpg file in your browser. 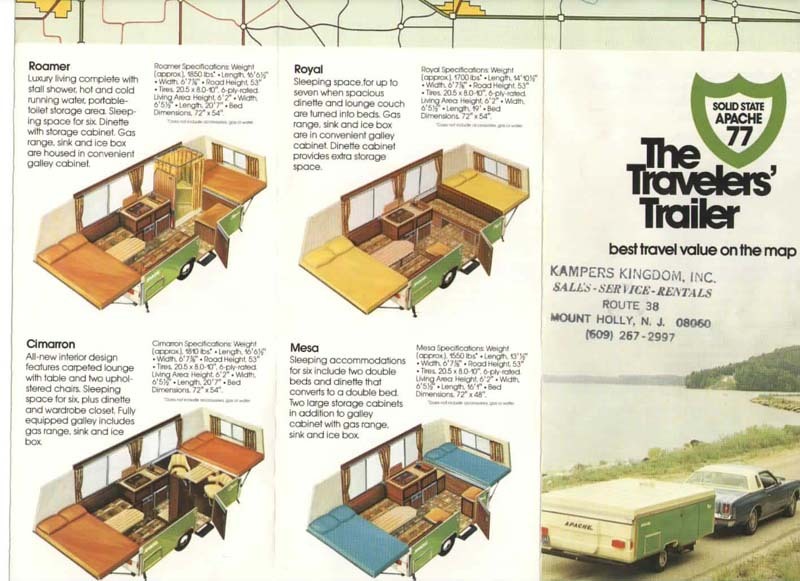 "Travels like a camper, Camps like a cabin". Thanks for this picture Harry! 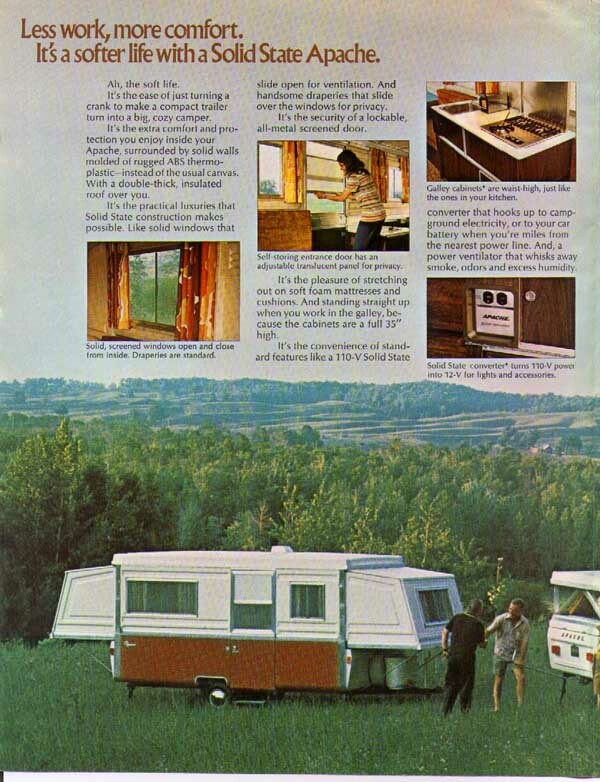 Now THIS 1973 brochure is fantastic! Everything is readable. Check this out! 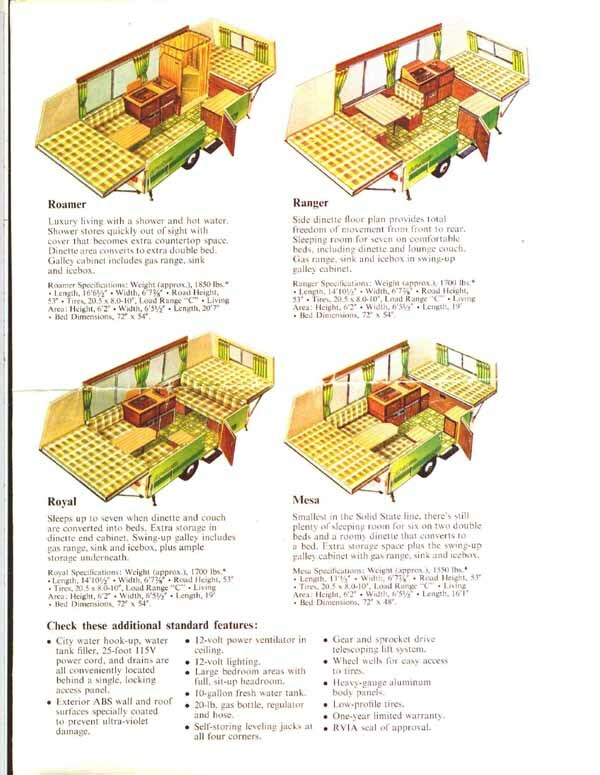 Click on a thumbnail for a close up of each page - complete floor plans and all. 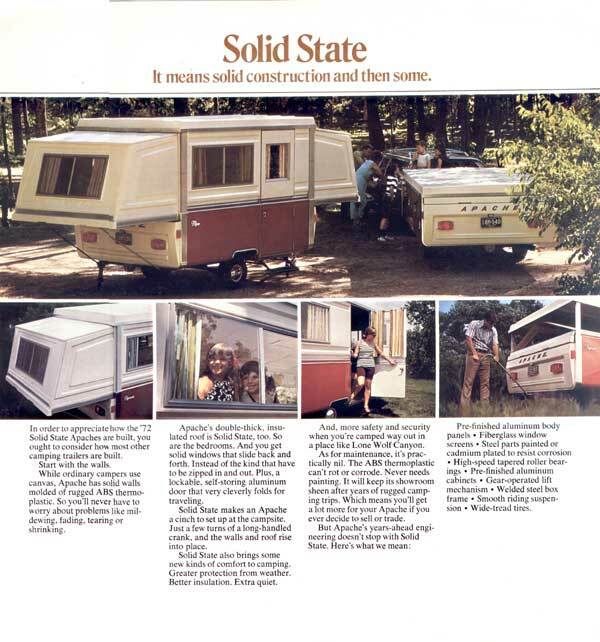 This brochure includes 4 solid-state models only. 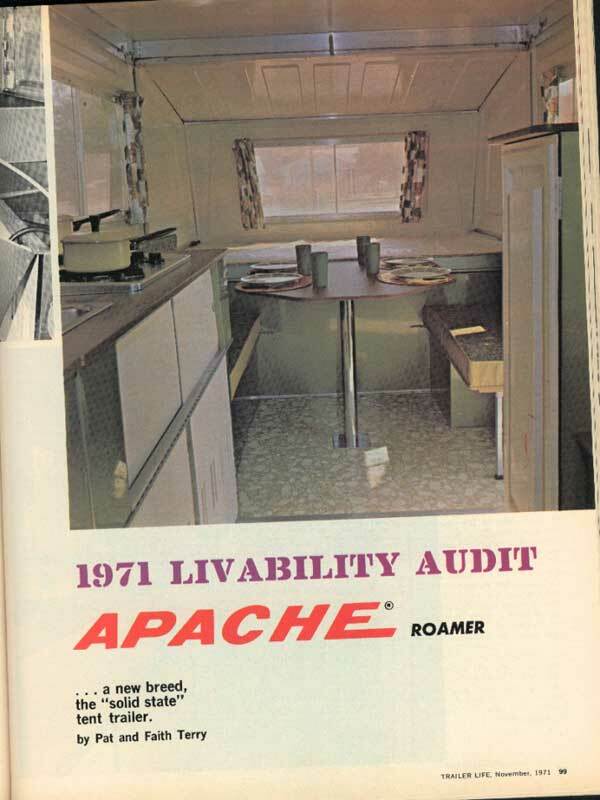 It doesn't appear that Apache manufactured any canvas-sided popups in 1973 (unless they just weren't included in this publication). This sure changed by '75... Thank you so much for sharing this one too Harry! JUST when you thought it couldn't get any better... we bring you to 1975! This brochure is in PDF format. Thank you Dennis for sending this in! Definitely a MUST-SEE for Apache owners!! Prints nicely on a color printer too!! There were eight different models to choose from in '75. Amazing. You need Acrobat Reader to view these pages. 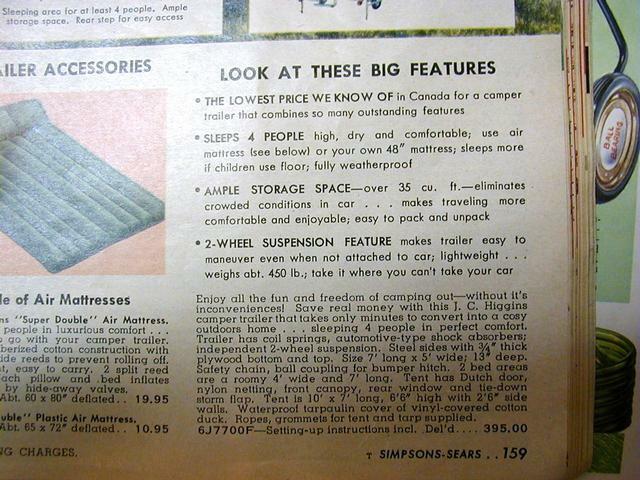 Base Prices2.pdf is apparently from 1975. We're not entirely sure what year the first one was published. Perhaps it was the same year, different dealer? These are cool files to view, especially the options lists. Imagine being able to order this stuff today! Thanks for sharing these Dennis! 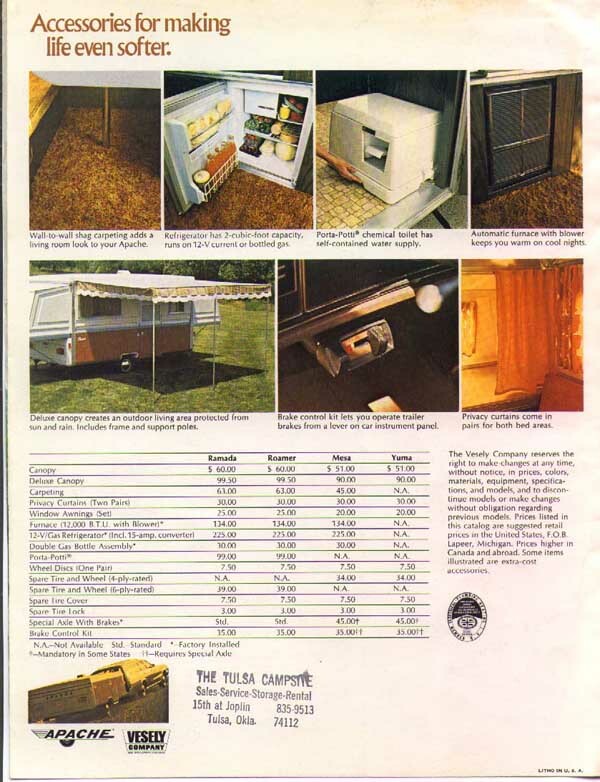 1976 witnessed a new color scheme as well as new features, like an externally accessible storage internal compartment. 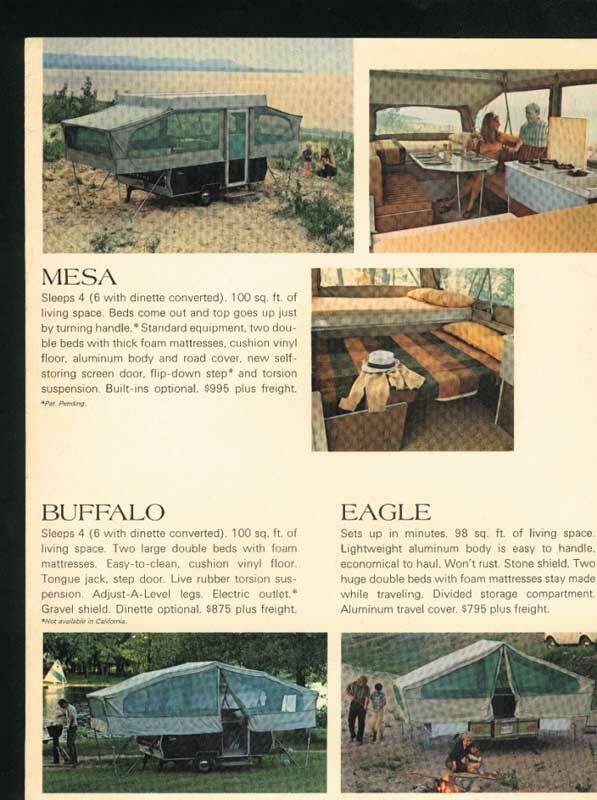 The number of available models in '76 was scaled back to six. Thank you Tom for sending this in! 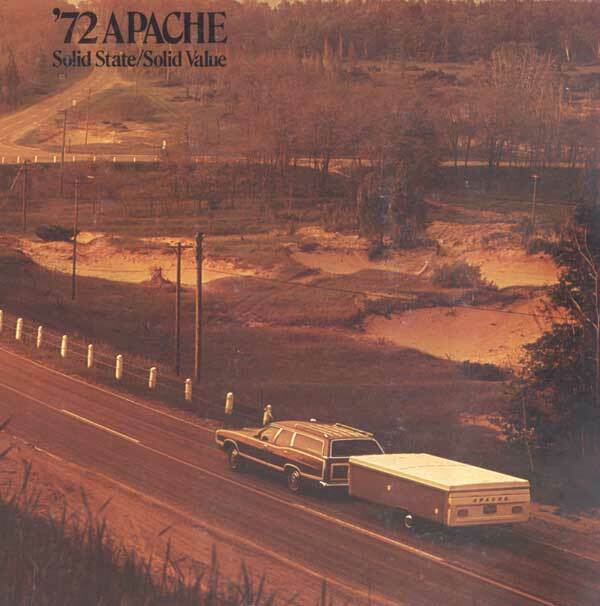 Here's a nice Apache ad from the February 1977 issue of Hot Rod Magazine. 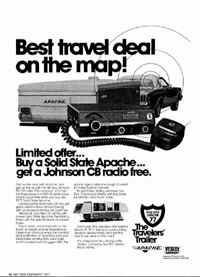 Buy a new Apache, get a new CB! (Citizens Band radio). CB's were very "cool" in the 70's. ("Big Ben, this here's a Rubber Duck...") Thank you Don for sending this in and thanks Dennis for a beautiful scanning job! 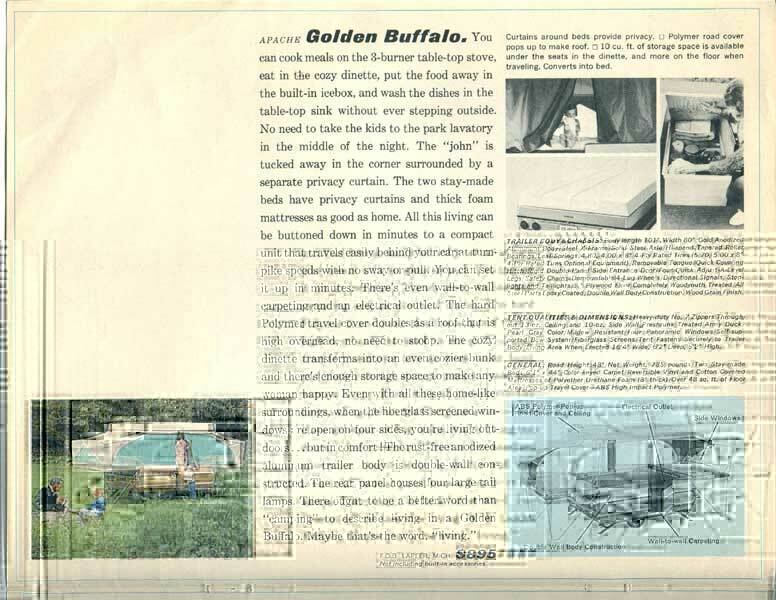 If you click this image it will take you to a readable ad in pdf (Acrobat) format. 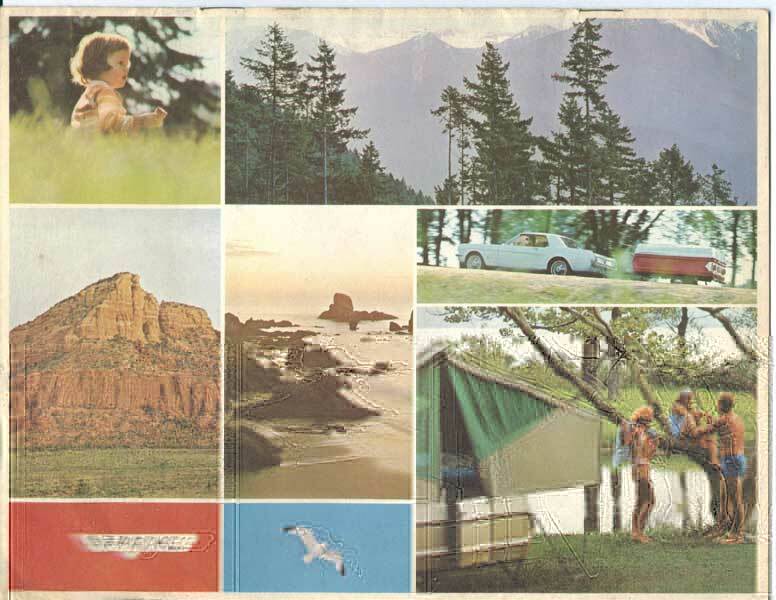 Now that your mind is in 1977, take a gander at this beauty of a brochure from the same year! The number of models available was scaled back again to five. Thank you Steve for sending these in!!! These are jpg files, so feel free to click on the thumbnails to view the close-ups! It's one year later, 1978. Five new canvas-sided War Eagle models were added to bring the total model offerings to ten! Wow! 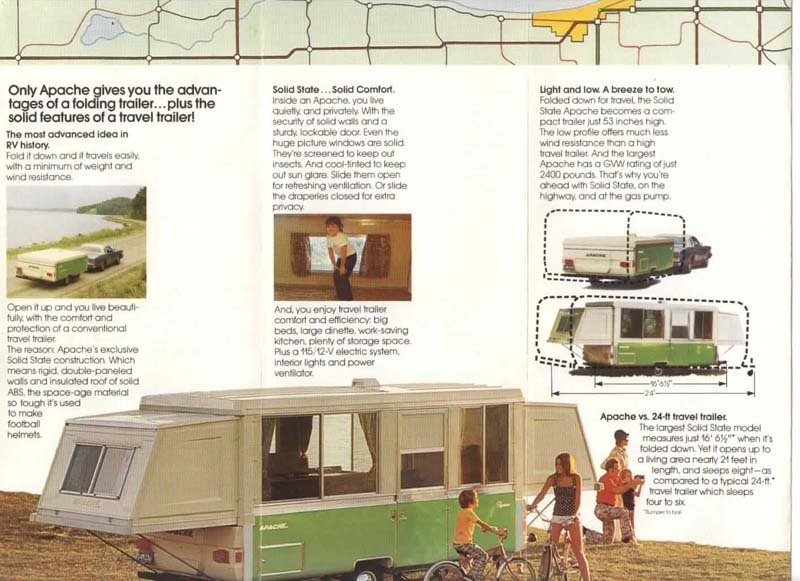 Here's a great '78 brochure that shows all the details. Thank you Ken! Welcome to 1980! A whole new decade, and a new look for Apache. 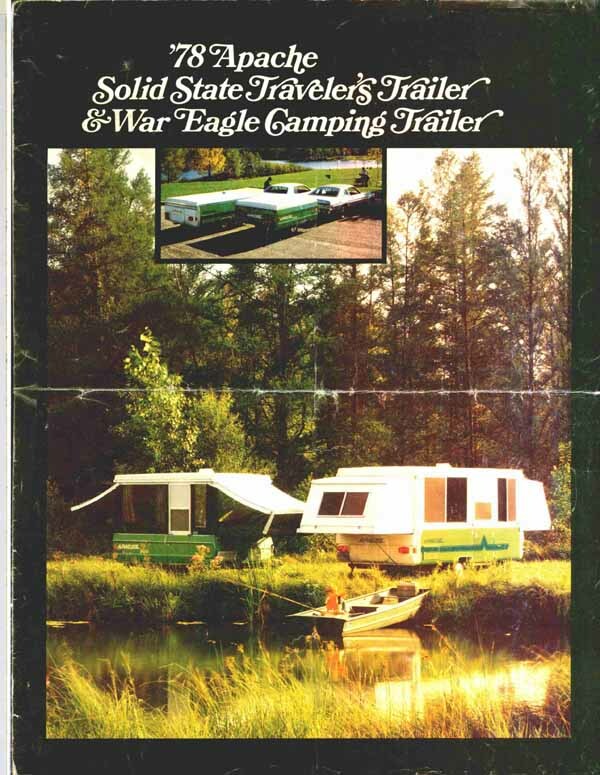 Here's a 1980 brochure sent in by Herb. "Challenges for New Directions in the 80's" as the cover states. 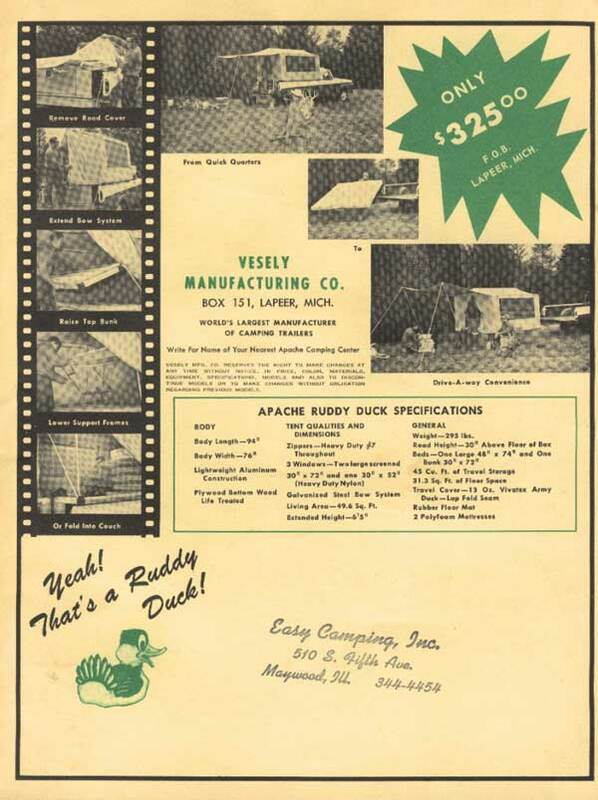 Looks like their brochure budget got a little tighter in 1980... 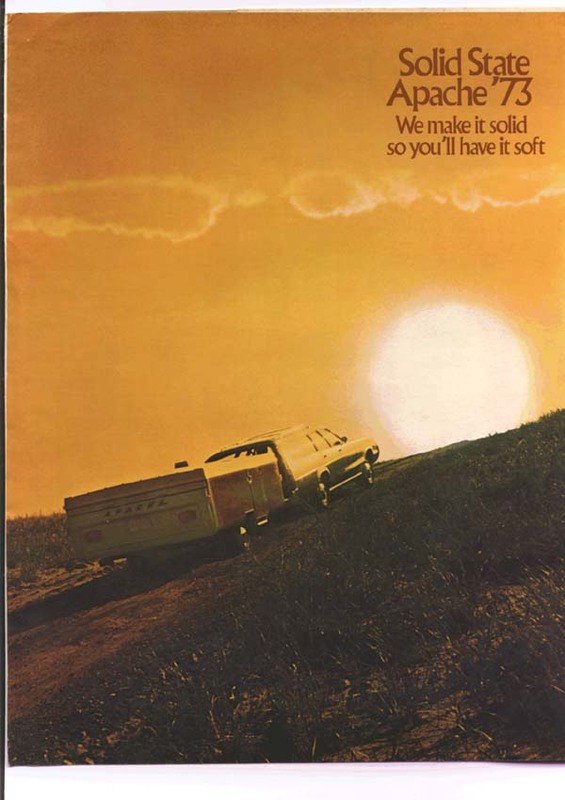 The model offerings in 1980 totaled five. Thanks for sharing these Herb! 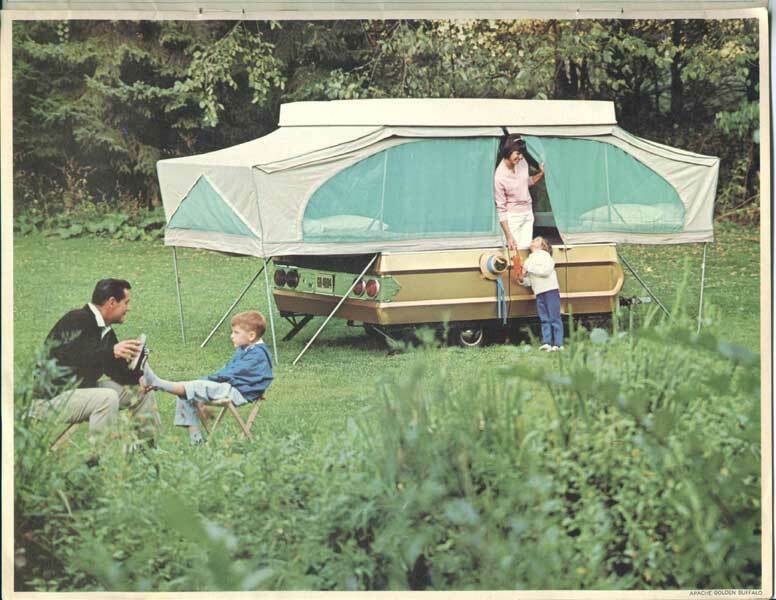 In 1981 the company manufactured only one model, The Cub, in 3 different styles (I, II, & II). 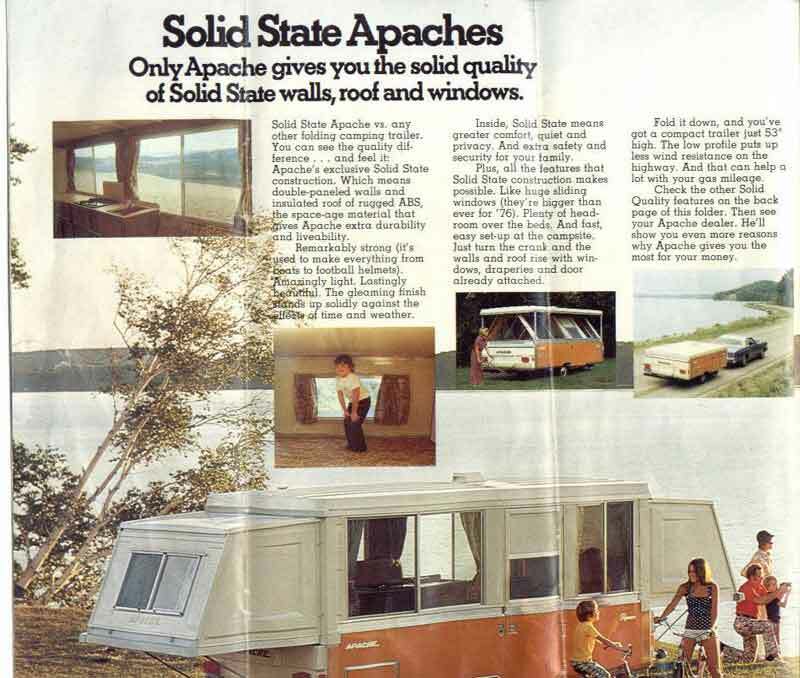 There were no Apache popups manufactured in 1982 or 1983. 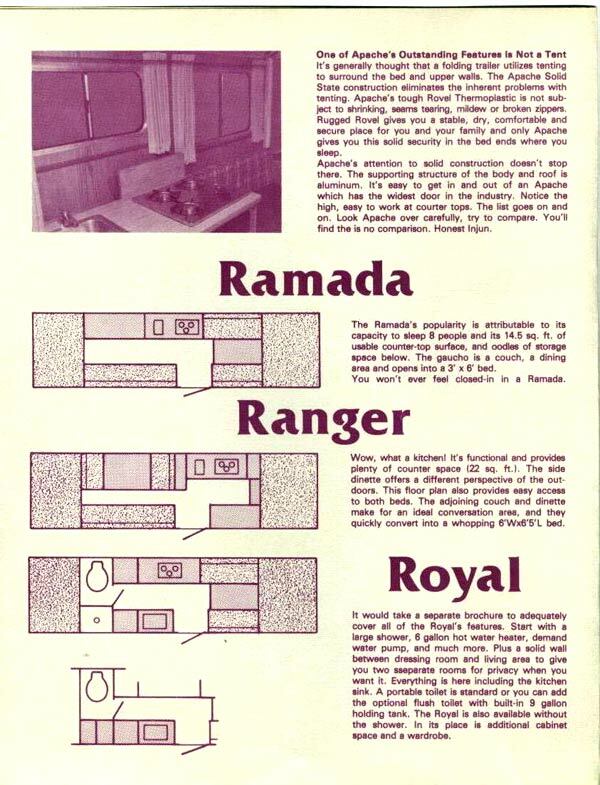 By 1984, only a Ramada I & II was made. 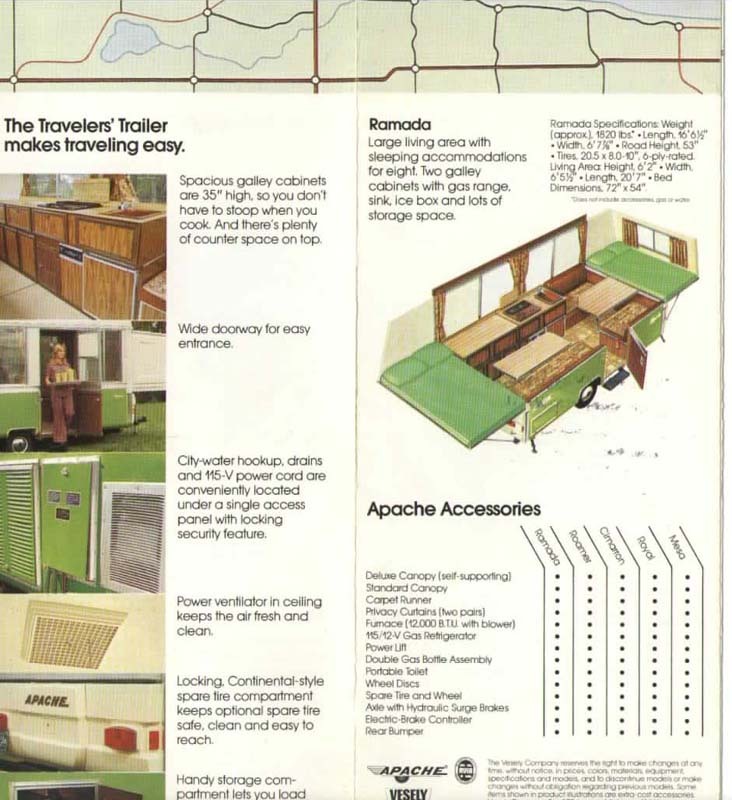 If anyone has a brochure from '81 or '84, please share it! 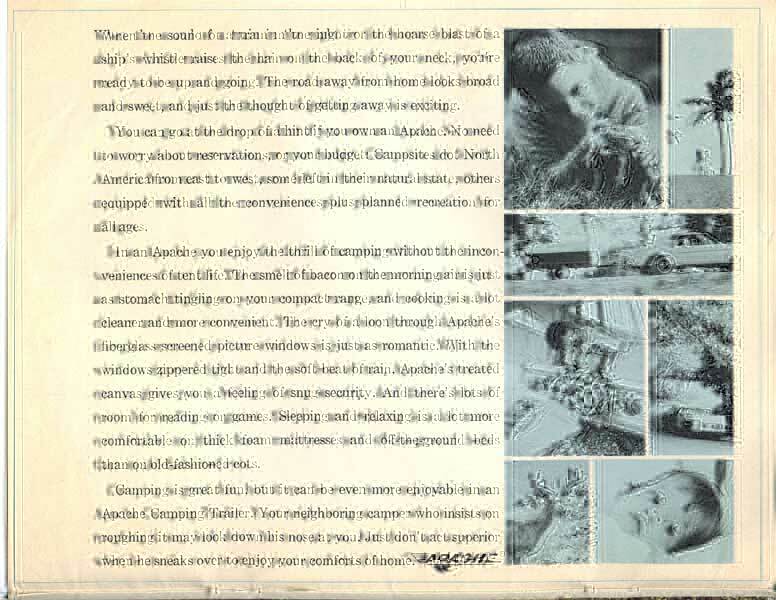 Here is a 1985 Apache brochure sent in by Jim. 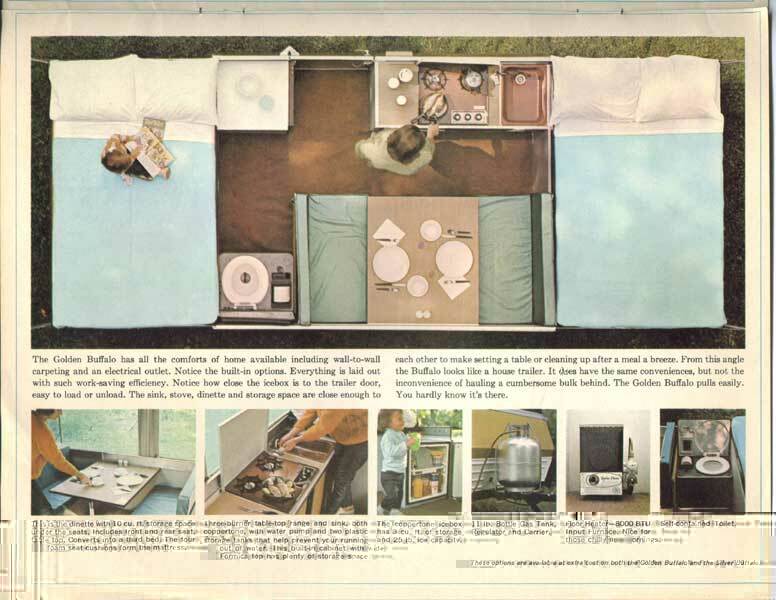 They sure got fancy here toward the end with the features: separate rooms, shower with hot water heater, wardrobe, range hood, etc. Apparently, the plastic material changed from ABS to Rovel. These jpg's will take you to the pdf document in Acrobat. Thanks for sharing these Jim! 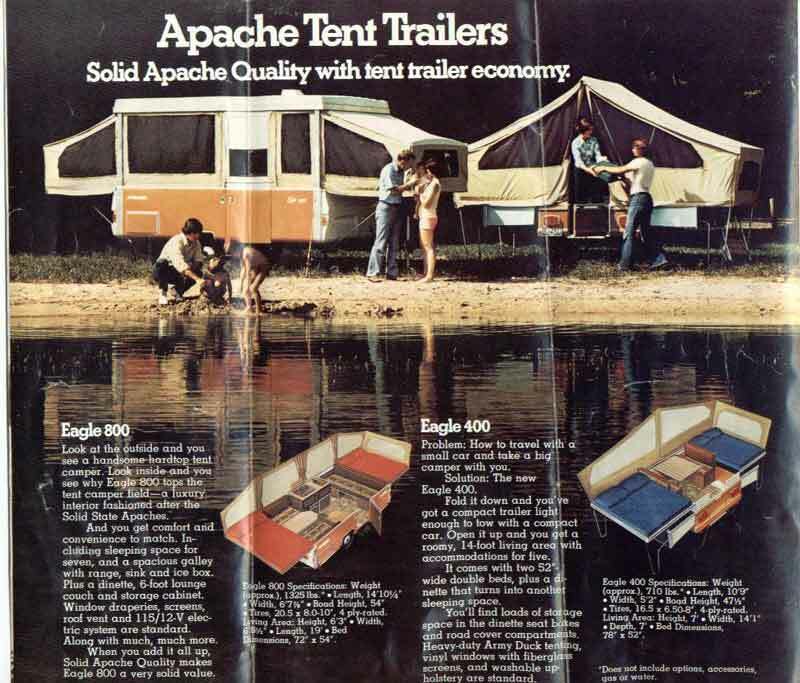 This brings us to the end of the Apache ad/brochure experience. The company went out of business in 1987. The plant in Lapeer was sold and all the remaining parts and tools were liquidated for cash. 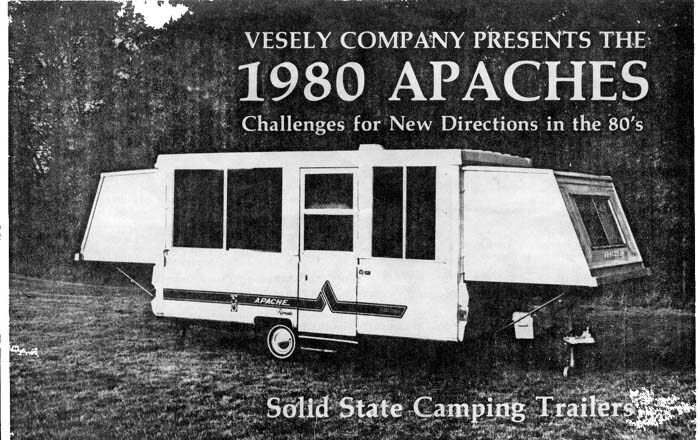 The rights to the Apache name & logo went to a company that is manufacturing RV's and pickup truck campers today (thus the absence of the logo on this web site...). 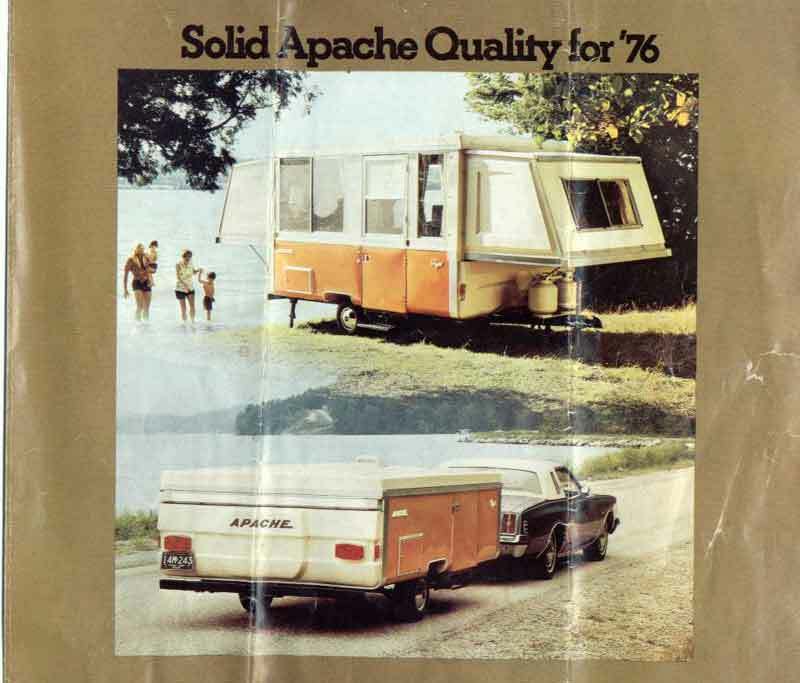 A number of ex-employees purchased the last of the parts (along with some patents and equipment I've heard) and formed Apache Sales Corp., which is still in business today (and where Ole' Elmer works!). 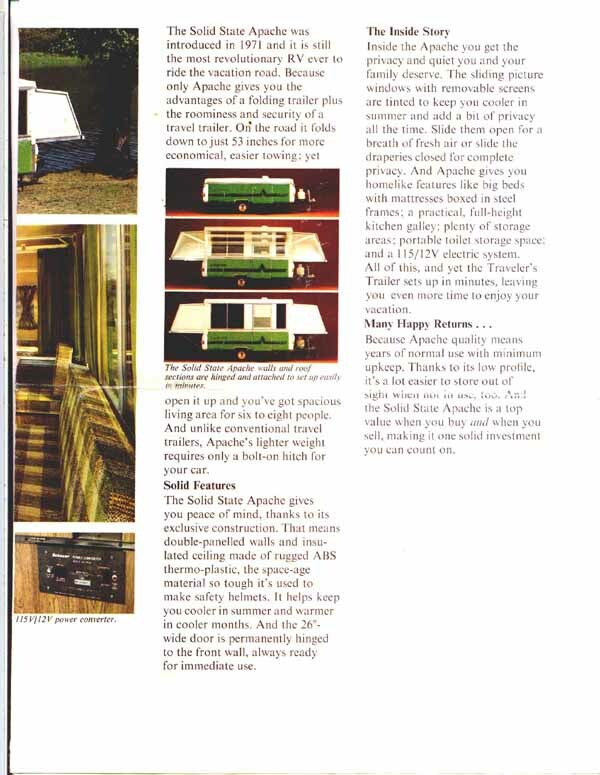 A few more stories surfaced at the International Apache Roundup which was held in Lapeer in August of 2002. Visit the International Roundup page for a newspaper article chronicling the history of the company, the company's demise, and a few more insider stories from various perspectives. 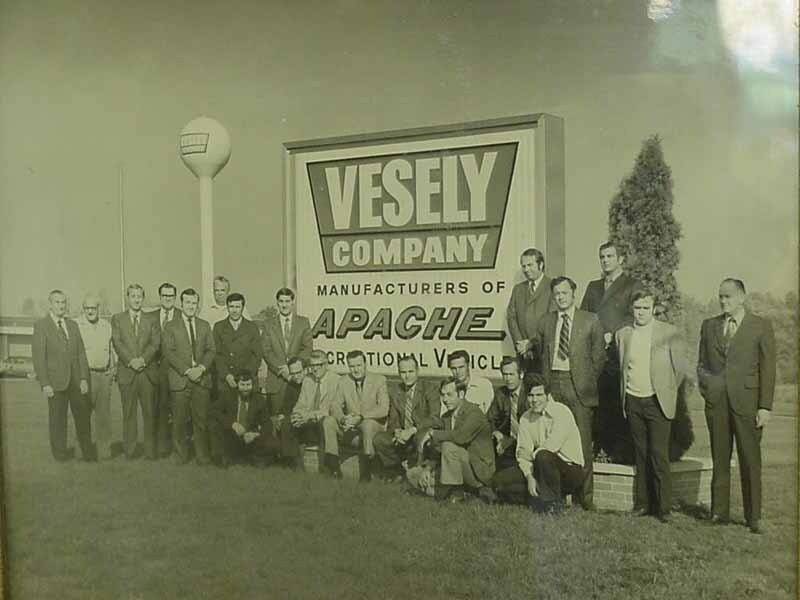 Please feel free to send in any Apache ads or other memorabilia you may have, or even more facts and stories to complete the picture of life at the Vesely company. If anyone knows any rhyme or reason to the Apache serial numbering scheme - please let us know!!! 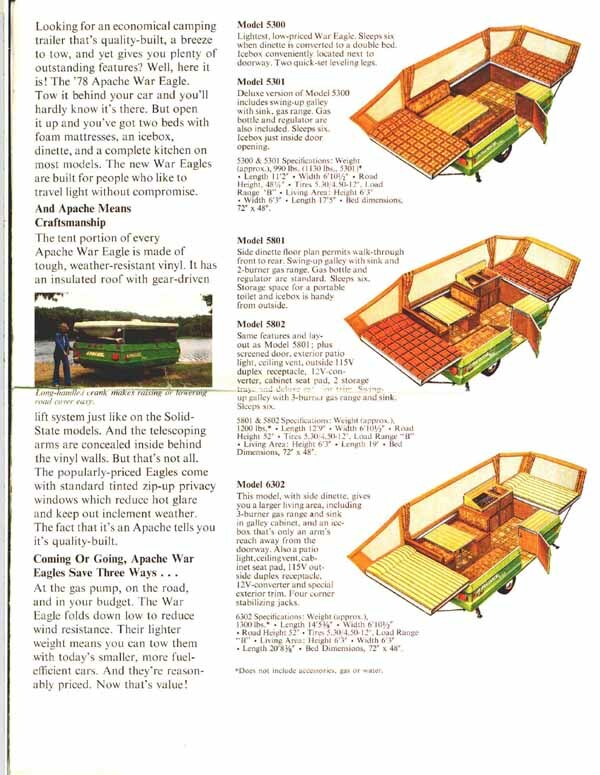 There's also some nifty Apache items on the Manuals page.